This is the 2nd print in the Focus on the Family Collection. 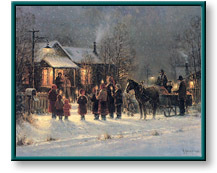 Heralding the Hope is the 2nd image in the Focus on the Family Collection and depicts a group of carolers holding candles and singing carols to a young family of three. They will be transported by a horse drawn sled and two cowboys. Heralding the Hope copyright© 1988 by G. Harvey is prohibited from being copied.